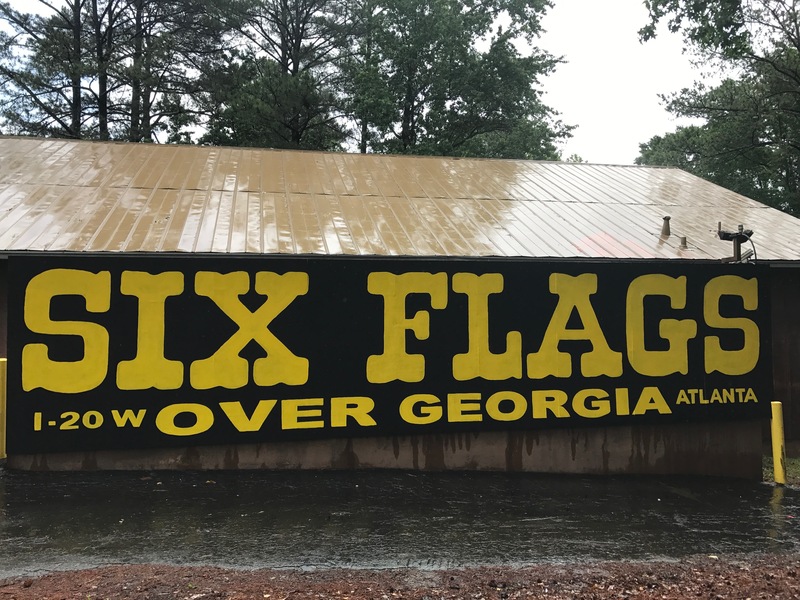 I drove up to north Georgia late after our first day of the American Coaster Enthusiasts (ACE) preservation conference at Alabama Splash Adventure. I stayed in a nice room at the local Econo-lodge and was still very sore from the week before from an injury at the swift water rescue class in California. If I wasn’t so excited about what was to come over the next few days I should have flown home and had my leg and ribs looked at. 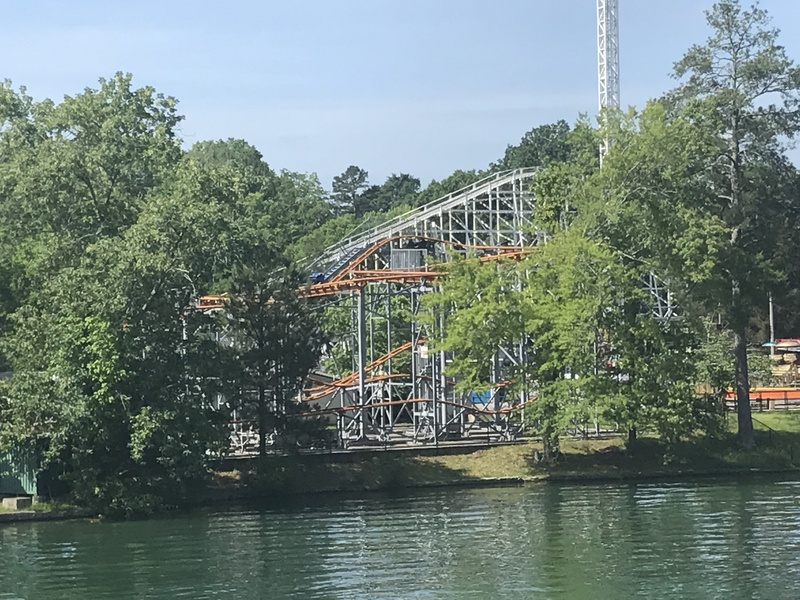 The early morning was ERT on the nice woodie coaster, Cannon Ball which ACE would dedicate as a landmark and plaque. We took our group picture after everyone rode the coaster a time or two and I went on to explore the rest of the park. The quaint little park reminded me of my first amusement park, Camden Park in my town of Huntington, WV. 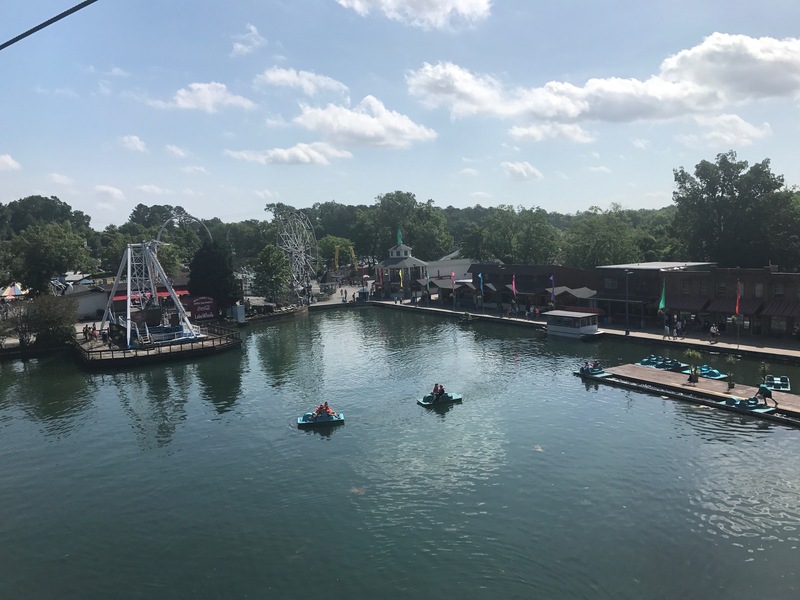 It had a little midway with games and food, a little lake with paddle boats and even a pretty cool looking water ride. 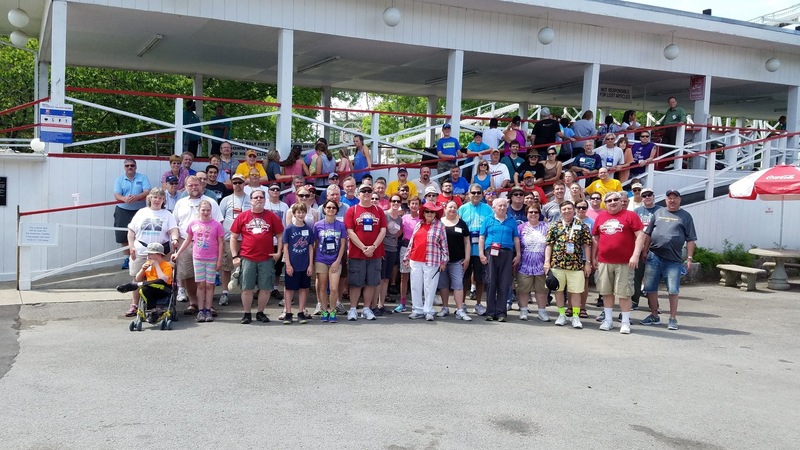 We all gathered for a nice lunch as a group of hamburgers, and hot dogs and ice cream sandwiches. After lunch we all jumped in our cars and headed south towards Atlanta to Six Flags Over Georgia where the preservation conference will really kick off in earnest. 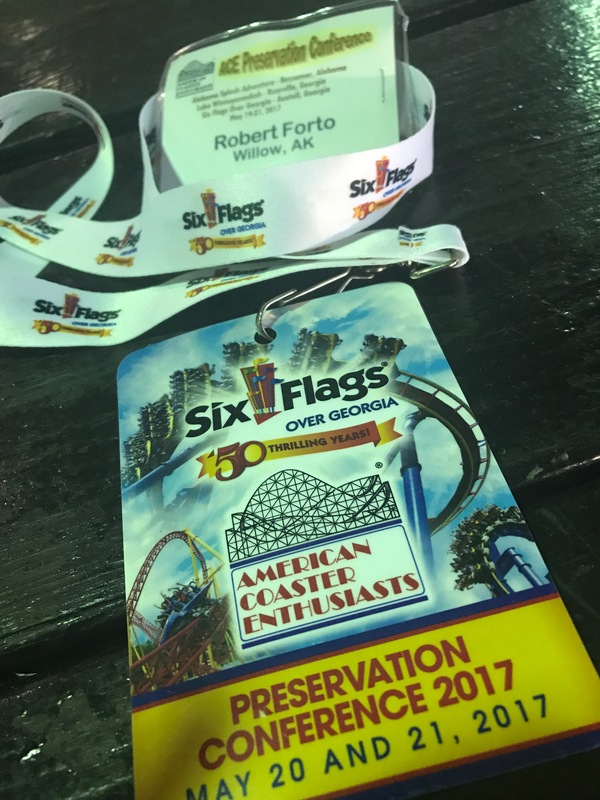 I made good time, despite the hectic Atlanta traffic and arrived well before our first appointed activity as a group for the conference. I jumped on a couple coasters and took the sky ride across the park to get a lay of the land. We all met for dinner under one of the big pavilions at the back of the park and I sat with a couple of guys and their families from Pittsburg. It was fun getting to know them and hear their stories of their coaster adventures. By the time dinner and the festivities were over it was getting dark and raining off and on. 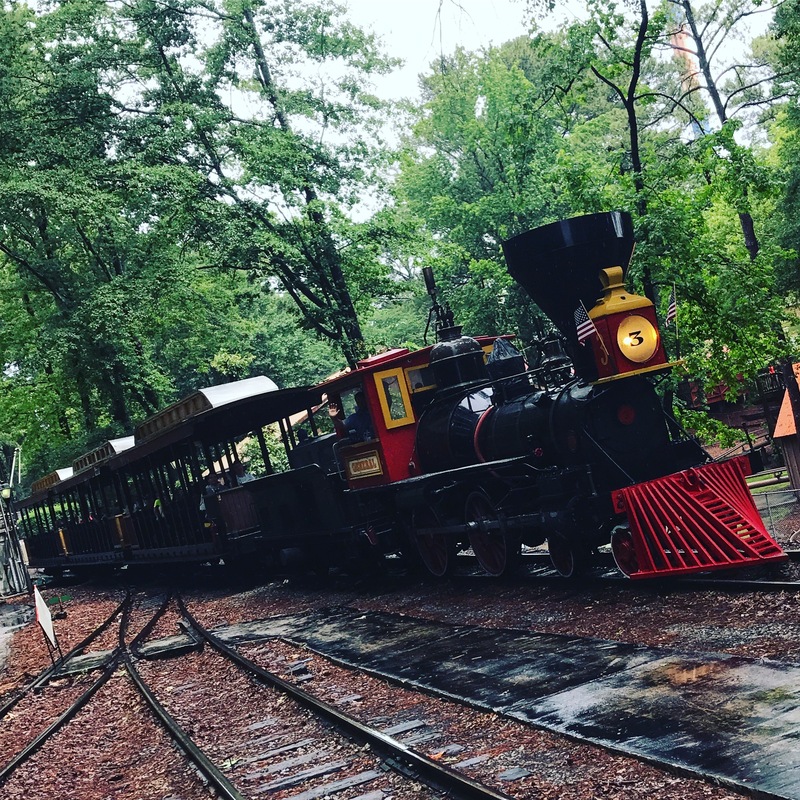 The park promised us ERT on several rides, rain or shine. We would be here tomorrow but it was good to get in the most action that I could when we were allowed to ride pretty much without waiting in any lines. 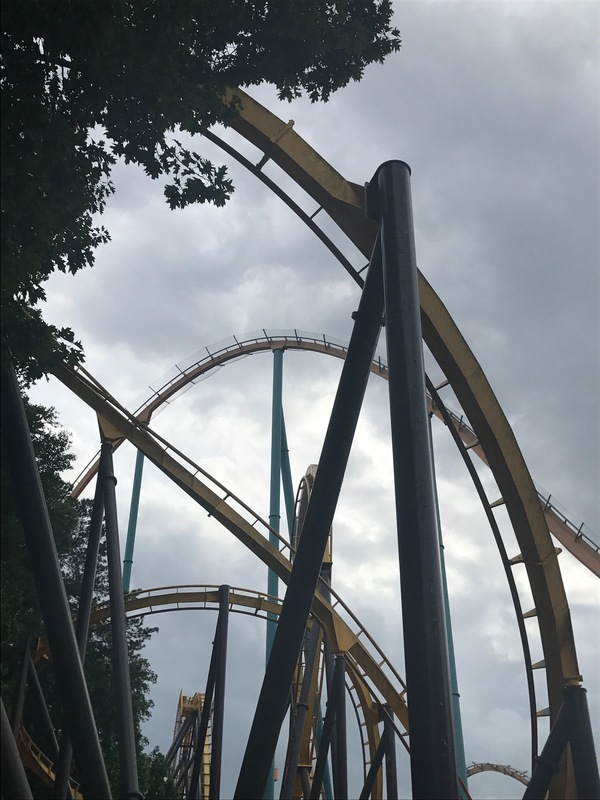 I took advantage of the ERT and rode the Batman coaster, Mindbinder, Joker’s Funhouse, Blue Hawk and the Dare Devil Dive coaster a few times each. I ended the night by ridding Goliath. 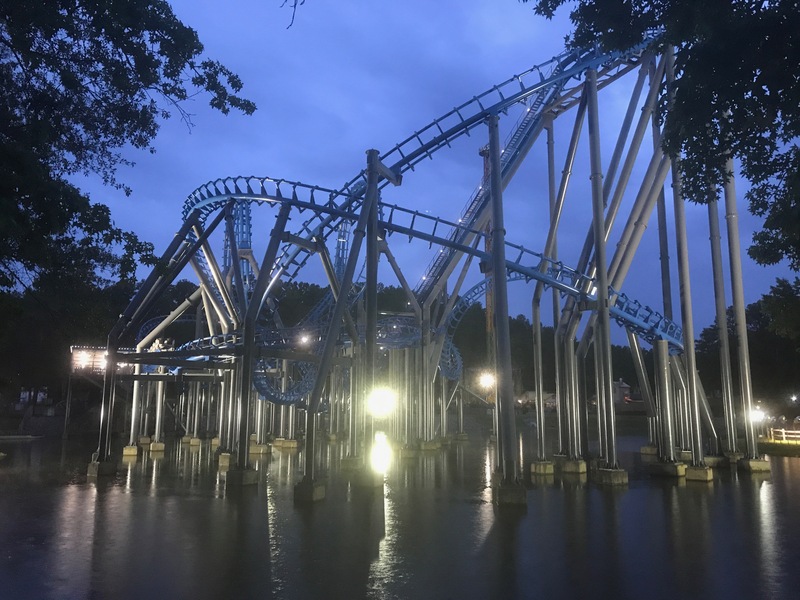 The coaster is called a hyper coaster or giga coaster in our world and it does not disappoint. 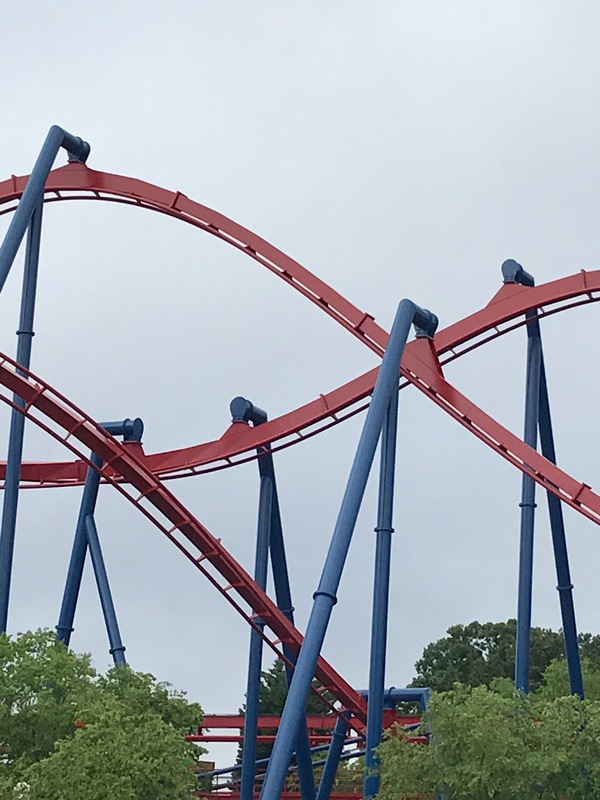 While it does not go upside down it has plenty of airtime and lots of speed. The restraint system is designed so it keeps your upper body free and gives you a felling that you could fly out of the car at anytime! Any coaster that reaches 200 feet in the sky earns the title of “hypercoaster.” It’s a rare breed that will take you straight to the sky. Once you get to the top of that first insane hill, you’ll waste no time in careening right back down a mind-numbing 170 feet. Then you’ll pop over the enormous drop like it was nothing, on your way to an even steeper 175-foot drop. In case you can’t tell yet, everything on a hypercoaster is super-sized. 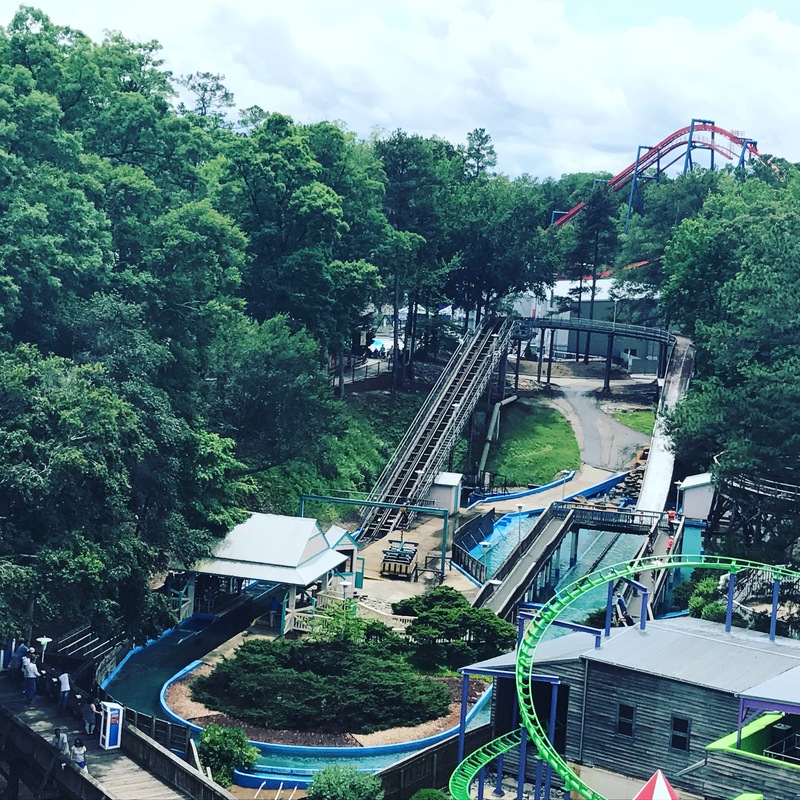 Another 12-story drop is waiting for you, then a barrelling race up and down a 540-degree spiral that will make you feel about a thousand feet tall. You’ll bank hard over sharp turns and stomp up and down mega-hills. How do a whopping 4 Gs sound? Because that’s what you’ll get on this mega-monster. You’re standing tall among the giants now. I left before a lot of the ACE’ers and headed to a hotel close by. 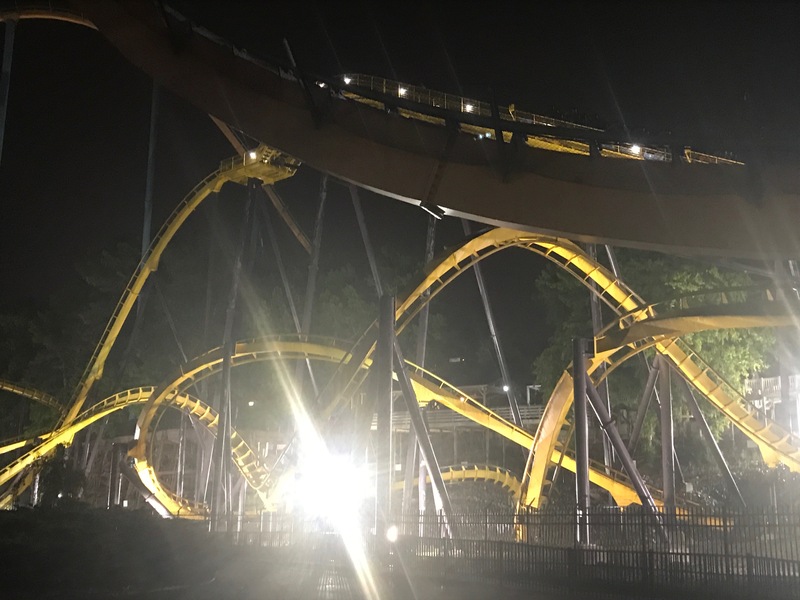 Tomorrow would be the final day of the conference and there was still a lot of coasters to ride. I can not believe how many coasters are at this park! I arrived early just as the gates were opening and made my way over to the Sports Bar for breakfast with the group. During our meal it started down pouring rain and would be off and on for the rest of the day. After a bagel and some juice I headed over to this little dark ride called Monster Mansion. It is one of those old school rides where you are on a little boat and it takes you through a world of animatronic muppet-like characters. It was like an LSD trip! Next up were the rides that we didn’t have ERT on the night before. 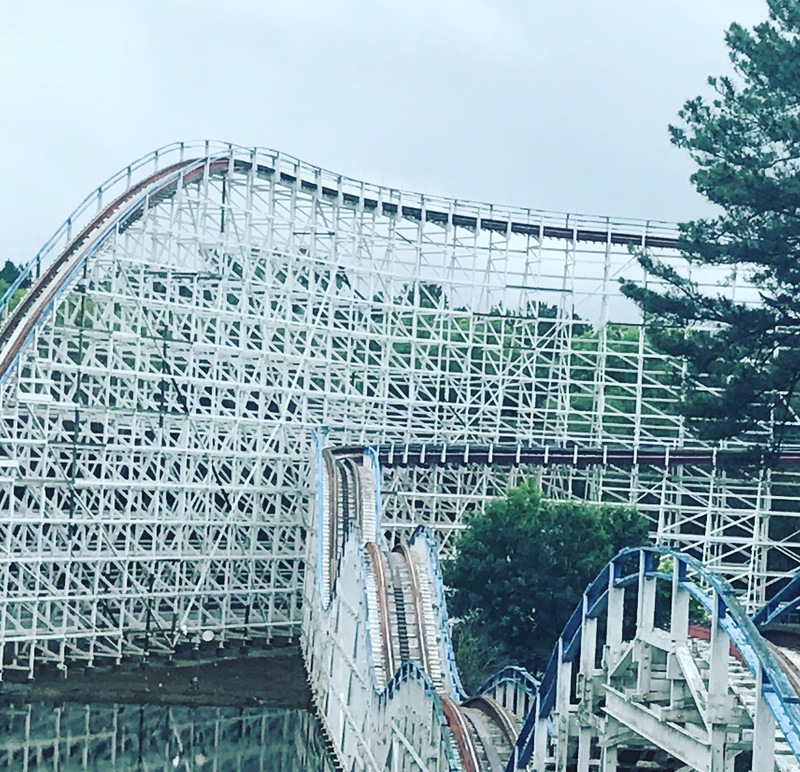 First for me was the Georgia Cyclone. 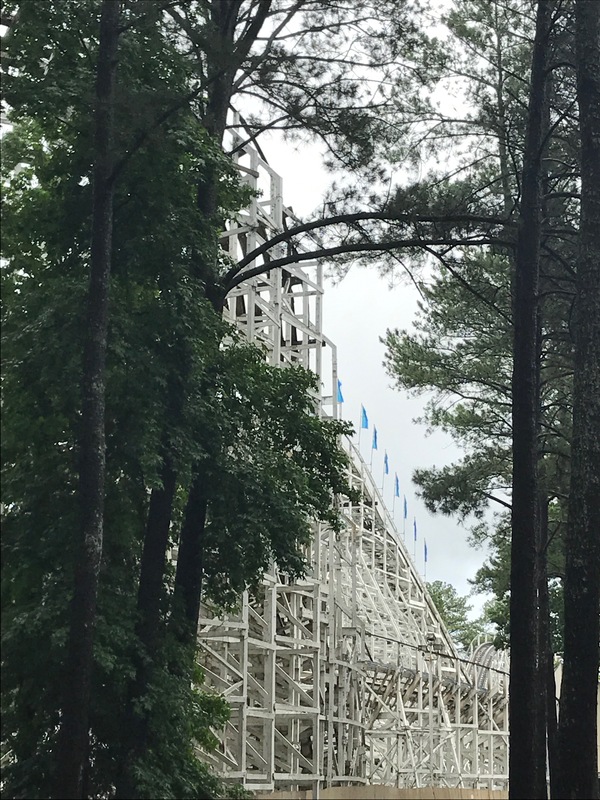 It was an old woodie that was so rough it felt like it was going to fall down. 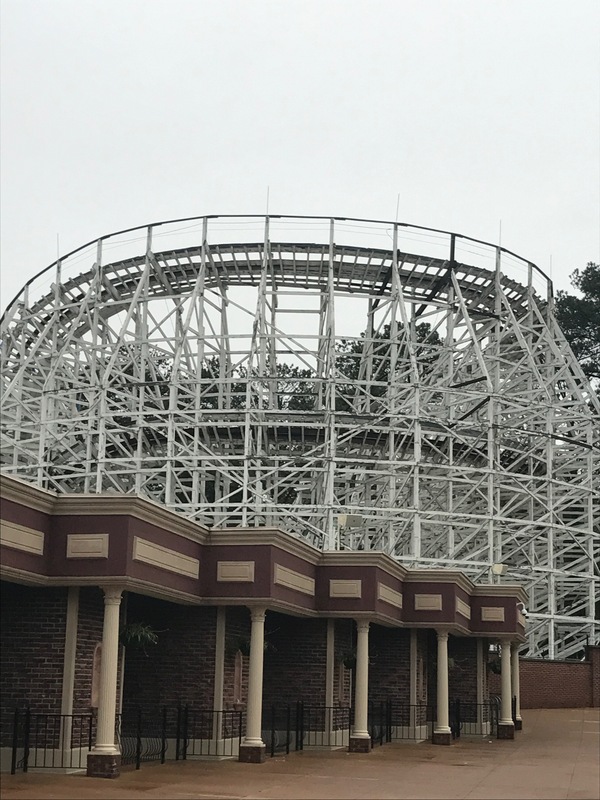 (Later this summer they closed the Cyclone down for good and will probably replace it with a new ride in 2018). 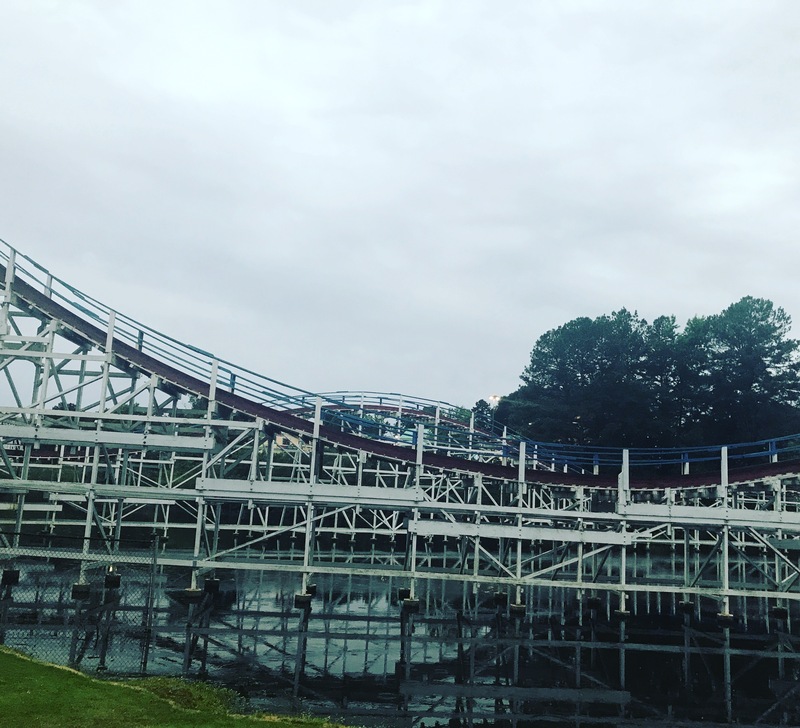 Then I headed over to another woodie, The Great American Scream Machine. This was the coaster we were here for as a group and we would dedicate a plaque as a landmark. The Scream Machine also felt very rough to me or it could be my sore leg and rib that were causing me to not have much fun. I also jumped on Blue Hawk again after lunch in the pavilion with the group. I love this coaster. It is so smooth and love the new style restraints. I wish they would retro-fit all coasters with this style. I also rode the Mine Train coaster which was one of the first rides at the park from the 1960s and then we were taken on a behind the scenes tour of Superman, Justice League and over near the Cyclone. 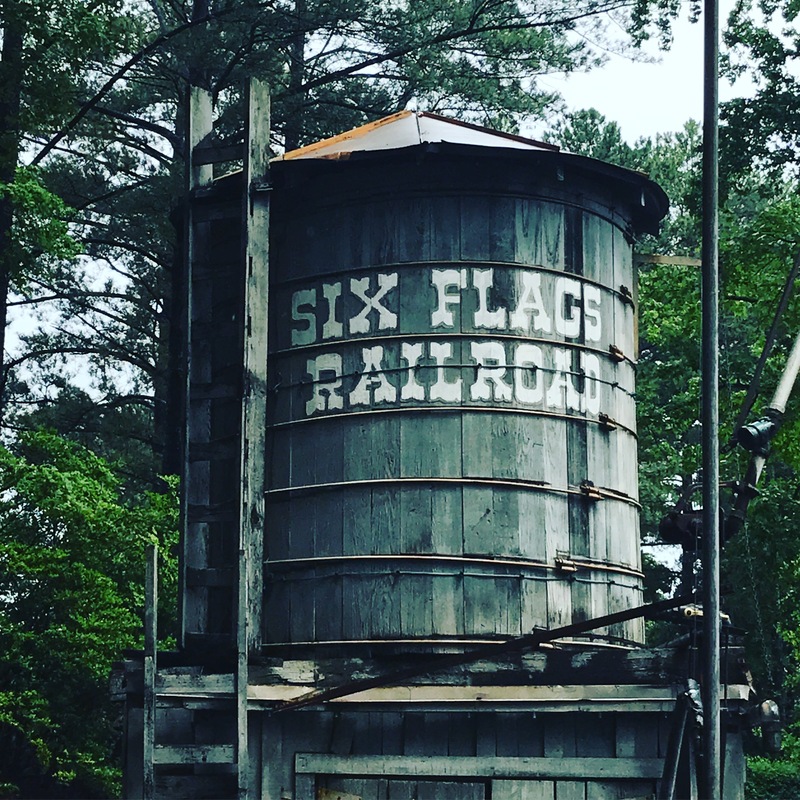 Did you know when this park first opened in the 1960s that the employees would put bumper stickers on un-suspecting guests cars in the parking lot advertising the park? 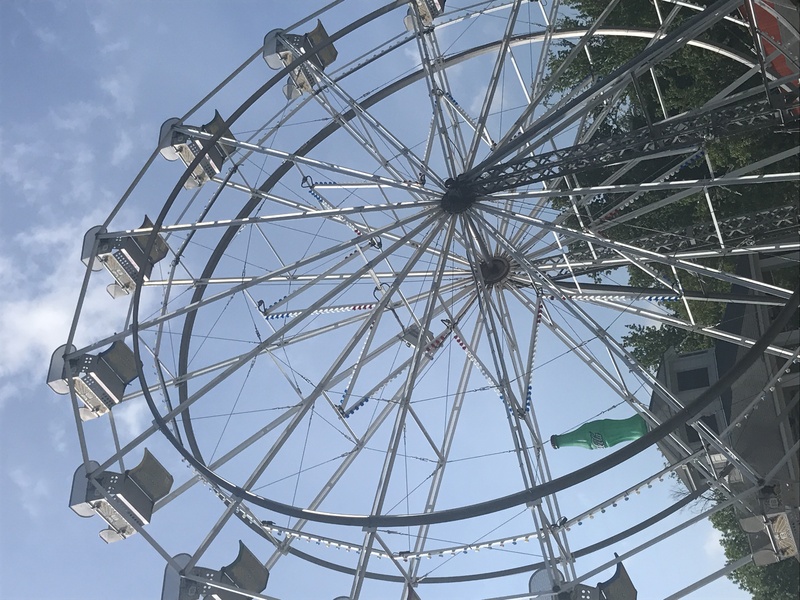 Since this park is right off of Interstate 75 it was a popular stop for tourists headed to Florida and beyond. Can you imagine if you found a Six Flags bumper sticker slapped on your $40,000 Prius today? You would be livid! The conference formally ended after lunch but a lot of us stayed late into the afternoon and evening at the park. I stayed until just after six and headed to the motel to get some rest and hopefully heal up my leg. I had an early morning flight back to Alaska and had to be at the airport at 4am. Who in their right mind flies at that time of day? I guess I do to save a few bucks. It has been a long week and a half on the road where I rode coasters literally across America and this was even before we set out on our annual Rock n Roller coaster tour. The ACE conference was awesome! I met so many people and made some new friends. It was fun to listen to their stories and to hear which parks and coasters are their favorites. I am surprised that Michele and I have been to so many parks and rode so many coasters in just three short years. I am looking so forward to the next conference. 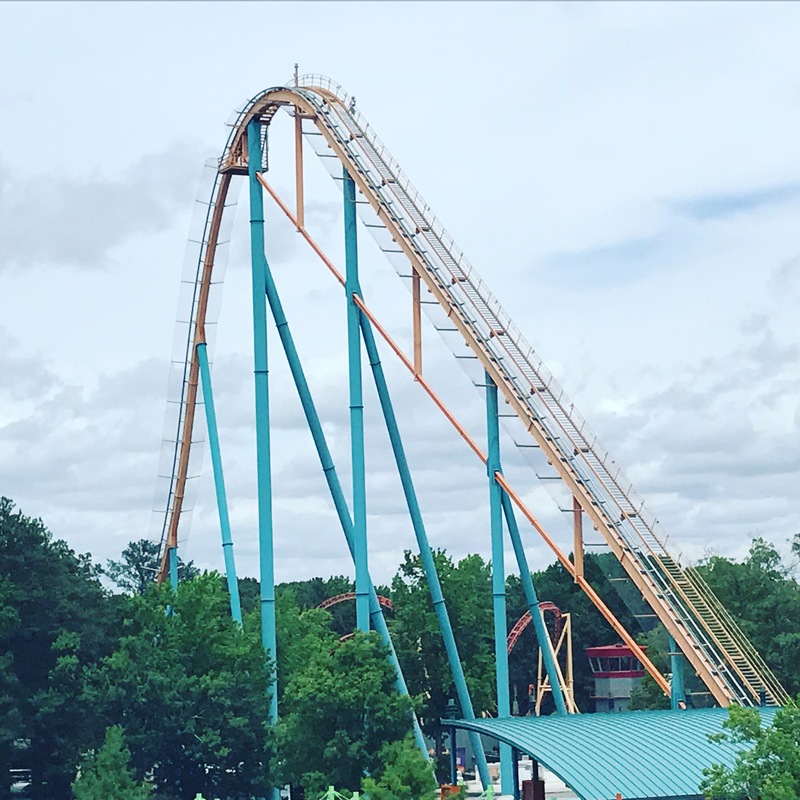 Hopefully it can be Coaster Con in Virginia next summer!